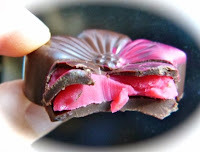 Were it not for the warm and sunny weather, I would have pinned one of these dark chocolate covered Blood Orange Blossom beauties from B.T. McElrath (Minneapolis, MN) to my hat before going out. They certainly would make good table favors. 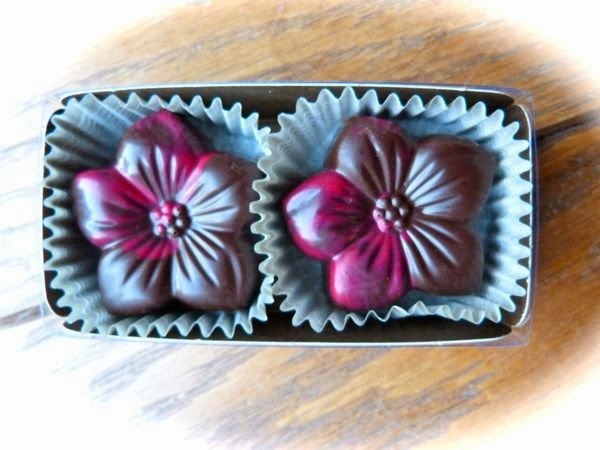 Filled with fuschia-colored, blood orange and white chocolate ganache, and encased in hand-painted, 70% dark chocolate shells, these flowers were pleasing to the eye and palette, with a subtle sweet, citrus finish. 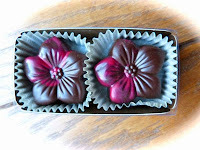 Today was Day #3 of Chocolate and Flower Theme Week.